I was first introduced to tennis at the age of seven at a local park on Long Island and quickly fell in love with the sport. I headed to my first U.S. Open shortly thereafter, somewhere around 1990. It became an annual ritual, not to be missed, and I’ve accumulated a tremendous collection of USTA member U.S. Open shirts to prove it. I’m what you would call a “Day Session” guy–someone who buys Grounds Passes, packs a big lunch, wears last year’s tennis shoes and spends most of his time wandering around outer courts in the first or second round looking for a front row seat at a match between two players most people have never heard of. Opening Day at the U.S. Open is one of the few times in life that I feel like a little kid in a candy shop–waves of euphoria hit me as I step off the 7 Train and walk into Flushing Meadows. The big problem is that it happens only once a year and I simply cannot wait that long for the next Slam. As much as I like exhibition matches at MSG, I crave more competitive tennis. After nearly 30 U.S. Opens, I decided it was time to expand my horizons and make the pilgrimage to France for Roland Garros. After working to convince my wife (who I’ve somehow gotten to watch the Tennis Channel with me every morning) that we should take a trip, we got started planning. Similar to the U.S. Open, tickets for Roland Garros (they don’t call it the French Open) go on sale in waves (first Fédération Française de Tennis [FFT] members, then the general public) and we woke up early to make sure we were able to buy them bright and early French time (six hours ahead of New York). 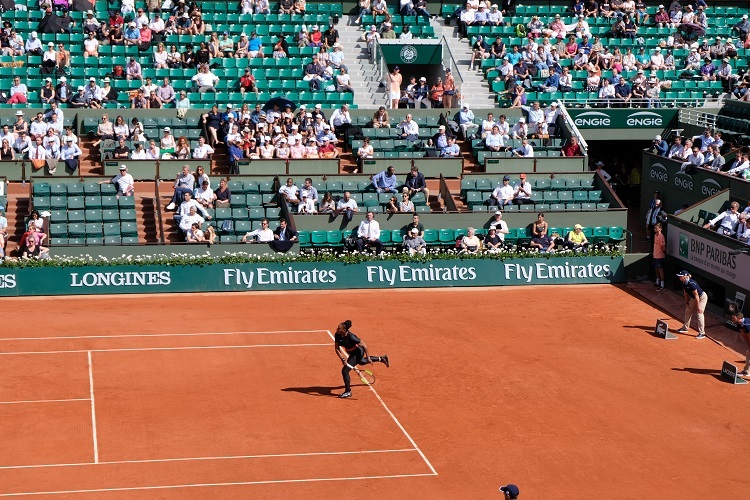 It is a very similar system to the U.S. Open, where you can buy Grounds Passes for access to non-stadium courts (2-18), or tickets for the stadium courts: Philippe-Chatrier, Suzanne-Lenglen or Court 1. We treated ourselves to several different kinds of tickets over the course of the tournament. We flew out on Saturday night before the tournament started (yes, it begins on a Sunday) and had an easy flight into de Charles de Gaulle Airport. Public transportation in France is significantly superior to the MTA/LIRR (no signal problems at Jamaica) and we had no problem taking a train from the airport to central Paris. In addition to being much cleaner, the transportation is also faster and runs like clockwork. The only thing you need to watch for are frequent transit strikes on the weekends. Our hotel was about 10 minutes from where the train let out and getting there was a very peaceful walk on a quiet Sunday. 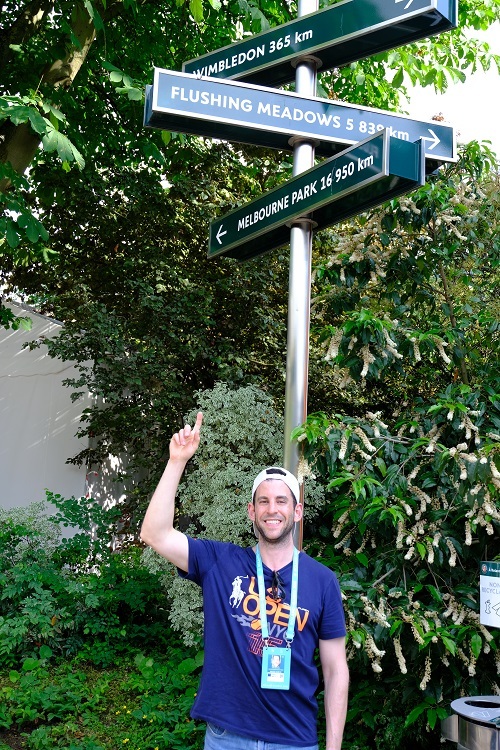 After a short nap, we headed over to Roland Garros, which took about 15 minutes by bus from our hotel. There’s also easy subway access, but we opted for the more scenic route. Roland Garros is much closer to the center of Paris than Flushing is to Manhattan. The tournament is a big deal in Paris and the entire city seems to be caught up in Roland Garros fever. Even the Eiffel Tower had a giant tennis ball on it with promotional events on a court under the tower that featured a junior tournament and Andre Agassi and Steffi Graf hitting. When we arrived, the line at security was not nearly as long as at the U.S. Open and you can walk through a beautiful park on your way in. The staff was incredibly friendly and nearly everyone is multilingual, doing their best to speak English with an obvious American like me. It was also very helpful that everyone involved has a different uniform that corresponds with their respective role, so it was easy to tell who to ask for help. The grounds are beautiful, although they are not quite as large as I expected. Roland Garros feels like a more intimate tournament and that created some real excitement for me. There are a good number of dining options around the grounds and you’ll likely find something for everyone. 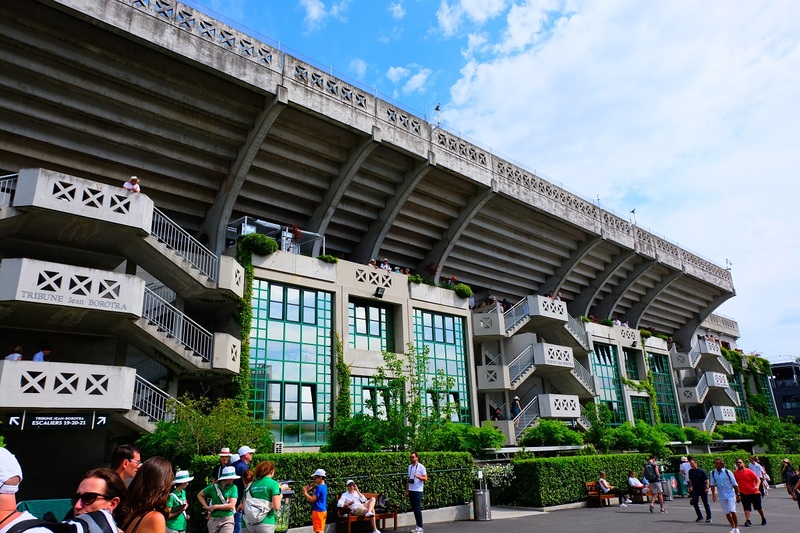 The grounds are also a lot quieter than the U.S. Open–no live bands and no music during changeovers on stadium courts. This was a welcome surprise, as it seems disruptive for loud music to be blasting as someone is about to hit a serve. I also did not witness any sports fans yelling out “fault,” or worse, as someone was about to serve. Perhaps French fans are a bit more polite? There are a total of 20 courts at Roland Garros, and I did not see a dedicated practice area like at the U.S. Open (which has 22 courts). As week one went on, I did see lines on the side courts get a bit longer as there were fewer singles matches for everyone to watch. 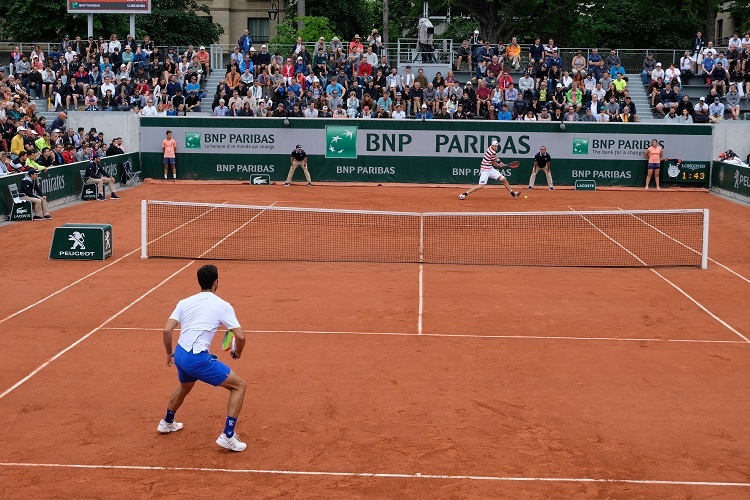 I do know that there are big plans for a next phase of construction for 2019 with a “Court des Serres” (Greenhouse Court) set to replace Court 1, along with massive renovations to the other stadiums and the grounds that will finish in 2020. I’ve always felt that Arthur Ashe Stadium is way too big for tennis (capacity of 23,771) and could benefit from being a whole section smaller. If I can see the ball better on the stadium monitor than live on the court, I might be better off wandering around with my Grounds Pass. Philippe-Chatrier is much closer to my ideal stadium court size (capacity of 14,840) and has great views from every seat in the house. Score one for Roland-Garros. Lenglen, with a capacity of 10,068, is a great place to watch a match and my overall favorite court with the right balance of big names and proximity to the court. We are all awaiting the new Louis Armstrong Stadium (capacity of 14,000), so it’s hard to evaluate how the two will stack up, so I call this a draw. Both courts have fishbowl designs and a unique atmosphere that is unlike any of the other courts. I’m partial to the old Grandstand at the U.S. Open that was recently retired (my favorite court), but I do have to say that the new Grandstand is beautiful. Score one for the U.S. Open. The courts are a brilliant orange-reddish and it was fascinating to see top players sliding on a surface that plays completely different than summer hard courts. As we watched all this tennis, we were interrupted a number of times by rain. On most days of the tournament, there was a wide swing of weather from 80 degrees and mostly sunny, to 60 degrees and torrential rain. There was light rain that didn’t stop play on many days, but we also saw heavy rain that caused an interruption with matches being finished the following day. You’ll want to bring an umbrella and shoes that can get wet or better yet, a light raincoat that you can pack in your bag. One other thing you’ll notice is that sunset happens very late, around 9:45 p.m. There are no lights, although you can get night passes for 5:30 p.m. entry on the stadium courts. It was a unique experience to watch matches starting at 11:00 a.m. and stretching for 10-plus hours of daylight. Things are also a bit more expensive in Paris, given that the dollar is currently weak relative to the Euro (1 U.S. dollar=0.85 Euros). You can charge most things, but be sure to bring a Visa or MasterCard as we encountered few, if any places that accepted American Express. You’ll also notice some other cultural differences–wine is nearly as cheap as water (which you need to ask for at a restaurant), chicken is sparse and I greatly missed the convenience of New York’s bodegas. Much of Paris seemed like high-end restaurants and cafés, and there were times where we wanted a more casual meal, but had difficulty finding one. Alas, after many days of sitting courtside, watching top pros grind it out on the red clay, it was time to go home. After years of waiting, I finally had the opportunity to visit my second Grand Slam and it did not disappoint. The people in France couldn’t have been more welcoming, kind and generous in both their hospitality and in accommodating our unfortunate attempts at speaking French. As for the tennis itself, the grounds at Roland-Garros were really something and I immediately fell in love with. I now have a whole new perspective to appreciate the highest level of clay court tennis. If you’re looking to visit your next Slam, I highly recommend booking a trip to Paris for Roland Garros 2019. Seth Sarelson is a contributing writer to Long Island Tennis Magazine. An avid tennis player since his grandmother bought him his first tennis racket at the age of 7, Seth grew up on Long Island and trained under Keith Kambourian at Bethpage State Park Tennis Center. He pursued this passion, playing USTA tournaments on Long Island and in the Eastern Region as a junior. A graduate of Cornell University, Seth has coached hundreds of students, run camps and continues to be an avid tennis enthusiast.